At times, a little bit of lateral thinking can get you out of a tough situation. The Godrej range of Lateral Filing Cabinets puts a spin on traditional design to provide the ultimate storage solution for your files. 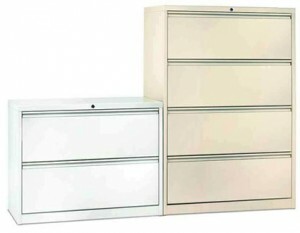 The Lateral Filing Cabinets efficiently reduce clutter while increasing productivity. Model Height(mm) Width(mm) Depth(mm) Unit Vol in CB.M.